The new Eurocargo, from CNH Industrial brand Iveco, was chosen by a jury panel of 25 journalists who represent some European commercial vehicle trade publications as their “International Truck of the Year 2016”. The award is one of a few wins for Iveco, spanning the truck, van, and tourism coach categories in the last three years. The win was announced at a dinner held in the city of Lyon, France at Solutrans, the biennial trade fair for haulage and urban transport professionals. The truck, designed for the medium product segment was recognised for having made the greatest contribution to road transport efficiency based on criteria that included technical innovation, comfort, safety, driveability, fuel economy, environmental footprint, and total cost of ownership. 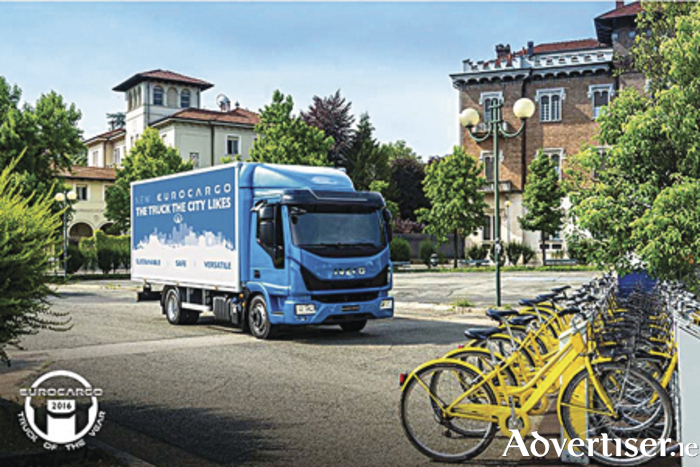 “Iveco has delivered a new medium duty truck that once again raises the bar in a highly competitive segment in which the Eurocargo has set the market benchmark in for the last 25 years,” commented Gianenrico Griffini, chairman of the jury, regarding the vote. CNH Industrial’s commercial vehicles and bus business seems to be a dominant player in the eyes of these juries, which isn’t the case here in Ireland. It follows the similar 2013 title won by the Iveco Stralis, and the “International Coach of the Year 2016” title for the Magelys from Iveco Bus. The sixth-generation Volkswagen Transporter has been awarded International Van of the Year 2016. This is the third time that the Volkswagen Transporter has won this award.